In late October, I received an email from Simple with the subject line “Have you been cheating on us?” It asked me to write back, so I did and have given them ample time to reply. Since they haven’t, I wanted to share with you all why I think Simple just isn’t worth the switch. When BankSimple was first announced, I was crazy excited. I shared it on Twitter. I told lots of people. Within the first 3 hours of the announcement, I had signed up for a beta account and emailed one of the founders to offer my services in helping them develop good customer support in the future. He replied politely and my excitement remained strong. Later renamed to just “Simple,” the premise of this bank is easy to explain: founded by techies, Simple will provide a fantastic, easy, and modern interface for a bank that handles and displays transactions instantly and charges no fees. If it sounds too good to be true, it’s really not. They do what they say they’re going to. But I still have some problems with them, and when they invited me to write them, I did so with the intent of it becoming an open letter if they never replied. subject: Have you been cheating on us? Hi Matthew!So you’ve deposited money into Simple, and you’ve swiped a few times, maybe paid a bill. Not to get all clingy, but what’s up? Since you haven’t had any recent transactions, we wanted to check-in. We know fully switching banks can be a daunting prospect, but we think it’s worth it and we’re here to help along the way. With Simple, you get much more than a debit card. You get a system to help you make sense of your financial life and track your adventures–from the mundane to the sublime. Sound lofty? We admit, we’re biased, but Simple has helped us, its first customers, change the way we think about our money. Simple’s not just a card. It’s a way to let your financial data come to life. Let us help you continue your adventure. Do you have any questions? Is there something keeping you from using Simple? If so, please reply and let me know how we can make things better. subject: Re: Have you been cheating on us? I really dislike this email you sent me. I’ve been considering writing a blog post about why I haven’t switched to Simple, and this email has probably pushed me over the edge to do so. It may be a while before I have time, though, so I will reply as you have suggested and share my current issues with you. There are two main reasons I haven’t switched to Simple, and what it really comes down to is that you haven’t provided a truly compelling reason for me to switch. Believe me, Simple, no one is more disappointed about this than I am. You probably don’t remember, but I was tremendously excited when you announced that BankSimple was starting up. Within the first few hours of the announcement, I had written you with an offer to work for you. This wasn’t because I needed a job–I’m actually quite comfortable in a job that pays well and at which I am successful–but because I loved the idea of BankSimple and I supported that vision. I signed up for the beta within the first hour or two that sign-ups became available. I was ready and waiting to switch. And I waited. And waited. And my bank, which has been great, caught up to you. I was a little put off when you invited thousands of people before me to join Simple. Maybe they had more money than I did. I can’t imagine it was because they were more excited than I was or that they had signed up sooner. I was more put off when it took so long for you to invite me to beta test that you had already launched an iPhone app and done a lot of other stuff that I would have liked to have been involved with. But I finally got my invite, and I was thrilled. Then I was told that I couldn’t get a card for my wife. Only I could be on the account. This pretty much killed it for me. I can’t switch my family to an account to which my wife will not have access. I can’t use Simple for my life when it doesn’t support my life. But for the sake of beta testing it, I went ahead and put some money in the account and tried it a few times. I have used Mint.com to manage and view my finances for several years now. It isn’t instant, as Simple promised to be, but it gives me some good tools. 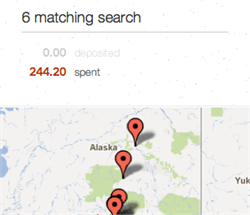 And as I started using Simple on a limited scale, I realized that I don’t really need an instant view of my purchases. I know that I just bought coffee, or Chinese food, or groceries, because I was there. I don’t need to buy something and then look at my cell phone to confirm that I bought it. And I don’t really need a map either, though I enjoy that feature. I know where I shop. What’s more, I don’t need Simple to manage my finances. I love your promises of no fees and all the protections you provide your customers, but the more I have thought about it, the more I have realized that, for me, none of these actually add value to my banking experience. And I suspect the same is true for all of your beta testers, and will likely be true of the vast majority of your customers after you go fully live. The people who use Simple are not the people who are going to run low in their checking account. They are not the people who are thoughtless about finances to the extent that they overdraft. They are not the people who need a “Safe to Spend” feature. They may like it, and I can see it’s value, but I don’t get charged fees now. I don’t have those problems, and if Simple isn’t solving a problem for me, where’s the motivation in switching? In fact, Simple doesn’t provide a very important feature that my bank, Everbank, does. In addition to being able to use every ATM without being charged by Everbank, a feature that Simple has, Everbank automatically refunds the ATM use fee charged by the other bank. So when I make a withdrawal from a local ATM with Simple, it costs me $3. When I make a withdrawal from a local ATM with Everbank, it costs me $3 and at the end of the month Everbank deposits $3 back into my checking account. It would actually cost me more to use Simple. And Everbank’s online banking is just as nice. Their check depositing is just as quick. And when I call their customer service, a person picks up the phone with no wait. So where’s the value in switching to Simple? What need does it serve that Everbank doesn’t? What does it do better? The only things it might theoretically do better are things I neither need nor want, which makes that a moot point. But there was still one feature I was interested in, and that was your “Goals” feature. After setting up a goal, I discovered it was going to move a certain amount of money each month automatically. I couldn’t find a way to manually control this, and that made it a non-starter for me. I meticulously budget every month, and I need control over that. There are some months where we will be spending more due to travel, or holidays, or automobile repairs, and I won’t be able to put money towards a goal. In other months, I can put significantly more towards a goal, which helps balance it out. I love the idea of having a checking account with pools, like savings accounts but without the complexity of having to open an account and then move money back and forth, where I can put funds for a particular goal. But not being able to manage this manually kills it. I’m better off sticking with Mint and a spreadsheet. And then you send me this email. Who’s terrible idea was it to accuse me of cheating on you? Did you really think an accusation like that would endear you to potential customers? It’s ironic, because my job is customer service. I lead a fairly large team of IT customer service people at a university, and when I wrote you a couple of years ago offering to work, I was hoping that I could bring my skills and experience in customer service to the aid of your business. I know how to do this. It is clear that your customer service people do not. And even if I was using Simple, it is not cheating to have an account at another bank. I have auto loans through Wells Fargo, checking and a money market account at Everbank, and a mortgage with Bank of America. I have not sworn an oath to any of them, other than to abide by their terms and pay my debts. We have no other relationship. This is a business transaction, yet you seem to be accusing me of whoring around. Why would I do business with you? Tell me, Simple, because you have surely failed to do so every step of the way thus far. Next postHow do you build a friendship? Very well written, wish I could do as well. Shirley say’s sounds like you are a chip off the old block. I get all excited about something, then it fails miserably to live up to standards, and I tend to massively relay my displeasure to them. Anyway good job, keep trying new things, and being excited about them, but rip them a new one if they don’t live up to their own hype. I can’t take most of this review seriously. I’ve never used Simple but I stumbled across it today and tried to look into customer reviews. It seems like you took your interactions with the company a bit too personally. Maybe it was your early involvement and offer to lend a hand or your initial excitement behind the idea of Simple. Either way, your main point for not using Simple seems like a personal problem. You didn’t point out anything that they are doing wrong (aside from features that are not in place yet because of it being in beta), only pointed out to say they are just as good as any other bank and the features that made Simple seem desirable weren’t actually something you personally felt like you needed. I agree, their email is a bit snarky but its clearly a joke (albeit a bad one). I’m sure the email is sent as a vehicle to see what it would take for customers to switch completely over. I don’t believe they expect their entire user base to only use their company. My main premise is in the title: switching just isn’t worth it. They’re not yet offering anything to truly set them apart, and they’re still not offering things I need to make it a primary bank. It has been almost a year now and I still cannot add my spouse to the account, for instance. Meanwhile, other banks are catching up. Simple has some fantastic ideas, but those ideas are easy to copy, and other banks are doing so. I’m still using my Simple account to send checks, but other than that, my primary bank has more and better features. My main points for not using it are: ATM access, ATM rebates, joint account, lack of good customer service. I think those are all valid reasons. Everyone’s bank doesn’t provide those features you mentioned your bank does. So i’d have to agree with Raul in that your article is more of a personal issue. I just signed up for a simple account. I wouldn’t even consider them being my main bank. I found this review more ridiculous as I read it as well. No one will overdraft that uses simple? No one needs to know how much money they have at the moment? I know you’re in a decent position career-wise at the moment, and I’m doing decent for a millennial, but the majority of my age group is struggling hard right now in the US job force. I could see this as a decent alternative to some of the banking platforms they use. I understand the couple of issues you had, but such a lengthy email to them was overkill in my opinion, and deciding that everyone who uses simple is going to be exactly like you is a joke. I know this post is a bit old, but I wanted to chime in with my opinion. I agree 100% with Matthew. I’m married with a joint account (not offered by Simple). I also have a small business account (also not offered by Simple). There’s absolutely no reason for me to switch banks. I guess Simple is only for single people and couples with separate bank accounts. Simple doesn’t even provide any hint of a timeline for these products. A huge waste of time and a big disappointment.